Warren Fahey sings ‘With My Swag All On My Shoulders’. I travelled the bush of Australia like a true born native man. We made a regular beat. And oft upon it lie. So I’ll stay here till I die. Anonymous. 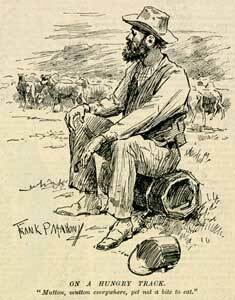 From Paterson’s Old Bush Songs, 1924. this goldfields song developed from an older song LIKE A TRUE-BORN IRISHMAN, sometimes known as DENNIS O’REILLY. Russel Ward, in The Penguin Book of Australian Ballads, 1964, explained that ”Lighthouse’ in the last stanza is a joking synonym for ‘swag’, the usually cylindrical bundle carried strapped to their backs when tramping from one locality to another. 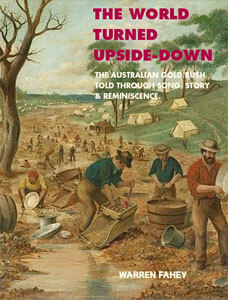 The songs of the Australian mining period are not dissimilar to those of the Californian and Canadian gold rushes. They cover the entire gamut of emotion – excitement, disillusionment, anger, and, occasionally, luck. There were songsters published to help circulate the songs. The most notable local songwriter was Charles Thatcher who was dubbed the ‘Colonial Minstrel’ and some of his songs, including ‘Look Out Below’ are still sung in the folk revival and are occasionally collected as fragments. Refer ‘The World Turned Upside-Down’ (2013 Warren Fahey) e-book available iTunes or this site’s shop.